JUNEAU, AK—Alaskan Brewing’s flagship Alaskan Amber now has some gold to celebrate its silver anniversary. Alaskan was awarded a gold medal for Alaskan Amber in the Red and Amber Lager category, and a silver medal for Alaskan Stout in the Sweet Stout category, this week at Europe’s largest beer festival, the 2011 European Beer Star Awards (EBS) and Brau Beviale. 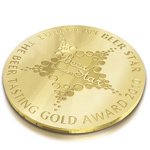 According to the competition website, the European Beer Star’s panel of tasters sampled 1,113 beers from 38 countries to award gold, silver and bronze in 49 beer-style categories using purely sensory criteria to identify “authentic, distinctive beers of an impressive taste and quality.” This was a record number of entries for the eighth year of the competition and a nearly 30% increase in entries from outside of Germany. The panelists judged the beer in early October, and the winning beers were announced at the Brau Beviale on November 10 in Nuremburg. Alaskan Amber is a richly malted alt-style ale fermented at cooler lager-like temperatures to replicate the brewing practices of gold-rush era brewers in Alaska. Alaskan Stout is brewed with a unique blend of oats and malts to produce a balanced, smooth beer with hints of coffee and caramel. Alaskan Brewing Co. is celebrating its 25th year handcrafting award-winning beer in Juneau, Alaska. The Alaskan Brew Crew has been bottling the unique character of the Last Frontier with historic recipes, local ingredients and glacier-fed water since 1986. Alaskan Brewing handcrafts Amber, Pale, White, IPA, Stout, Smoked Porter, Winter Ale, Summer Ale and a variety of limited edition beers in the Alaskan Pilot Series. Visit www.alaskanbeer.com.